Home » Paid » 100 Coins » Munai Kuma and Friends: Let’s Move! http://www.line-stickers.com/ – Munai Kuma and Friends: Let’s Move! 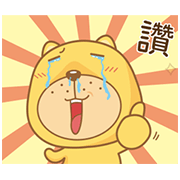 Line Sticker | Only you can create your own happiness! Name LINE Sticker: Munai Kuma and Friends: Let’s Move! Publisher : HappyBox international Co LTD.